There are some great console commands in Battlefield 4, such as the FPS display and frame rate limiter. But it can be a pain to type them in every time you load the game. In Windows 7 or 8, click the Start button and then click inside the Search box. Type “notepad” and hit enter. Or in Windows 7, go to Start -> All Programs -> Accessories -> Notepad. Click the File menu in Notepad, then Save As. Once saved, this user.cfg file will be launched automatically when you join a server and your settings will take effect. 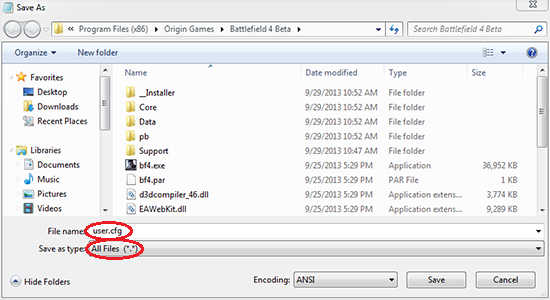 I did it exactly but Bf4 just wont load it. Make sure you follow the instructions exactly, and select the file type “all files” from the dropdown menu. Otherwise you will end up with a file named user.cfg.txt and it will not load. my game is loading but nothing changed. any more help? I would double check the folder with the config file and make sure it doesn’t have a .txt extension. Also, make sure each command is one per line and that you’ve typed them each correctly. You could start with just one command, such as “perfoverlay.drawfps 1” to make sure that setting works correctly. I’ve just tried to do this twice. Both times I have followed all instructions to the letter. Game boots fine, but then FPS fluctuates between 29-51 – with massive stuttering. First I would make sure it’s the gametime.maxvariablefps command that’s causing the problem. Take out the command “perfoverlay.drawfps 1” and leave only “gametime.maxvariablefps 60” in. Try it out – you won’t be able to see your framerate, but just see if gameplay feels fluid. If not, try adjusting gametime.maxvariablefps to different values. Start very high, such as 150, just to see if it’s happening regardless of value. If it runs smoothly, gradually lower the value. I’m not sure if these will have an effect, but it’s certainly worth a try. Are you using crossfire? I am, and earlier in the BF4 release I actually had smoother gameplay with crossfire disabled. To try that out, go to the Catalyst Control Center, then Performance, then AMD CrossFireX and disable. Apply the setting. Sometimes it doesn’t take effect properly, so I always close CCC and reopen and make sure the setting stuck. If you do get better performance with crossfire disabled, you’ll unfortunately have to wait for a future patch or new AMD driver which addresses the performance issues many people seem to still have. As it turns out, I think I may have fixed it myself. I unparked my CPU cores and it ran smooth as butter. I did notice that I had significant screen tearing when I set gametime.maxvariable fps 60, but increasing that up to a value of 70 seemed to fix it. Works perfectly. Just followed the guide like you said. Thank you for the guide and tips!